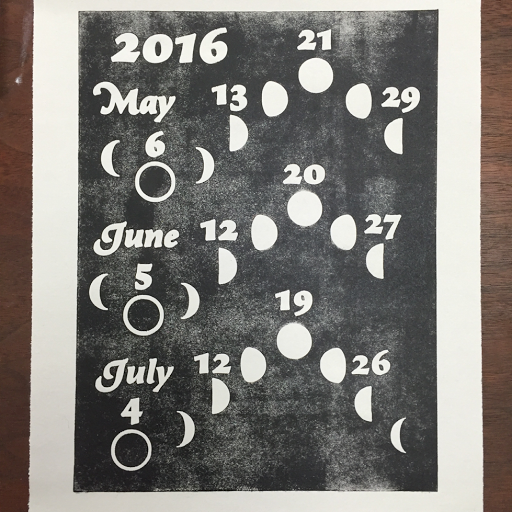 Yesterday I received confirmation that Heather, one of the owners of the Whiteaker Printmakers studio, will be available to help me print the edition of lunar calendars on Monday after the intaglio class. This is great news, and really lights a fire under me to nail the carving of this printing plate. I gave myself four days to get the kinks worked out, and I’m glad I did. It looks like I might need them all. 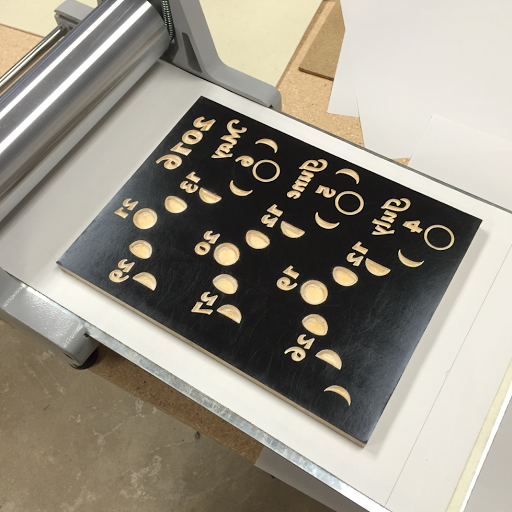 Every plate requires about 7 hours of shellacking, drying and sanding before it’s ready to print. I can’t multitask them because the next plate needs to include the lessons learned from mistakes on the last one. The first thing I noticed is that carving text is going to be very tough. I am making this image large in the hopes that I’ll be able to render a the text pretty well. It’s not looking very good. 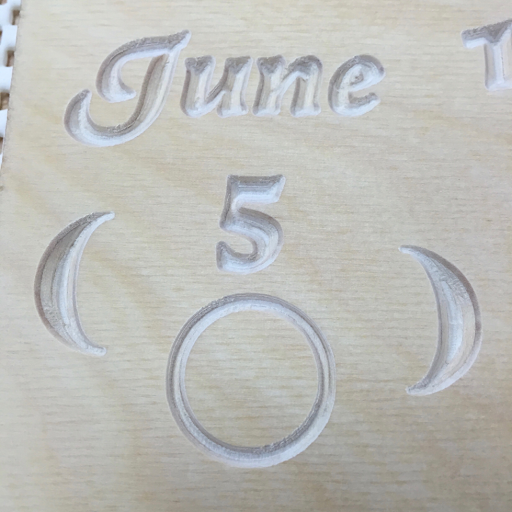 The counter on the “e” in “June” broke off when carving. I’ll try sanding the surface down a little to get a tiny dot there. If that doesn’t work, that letter will look terrible. 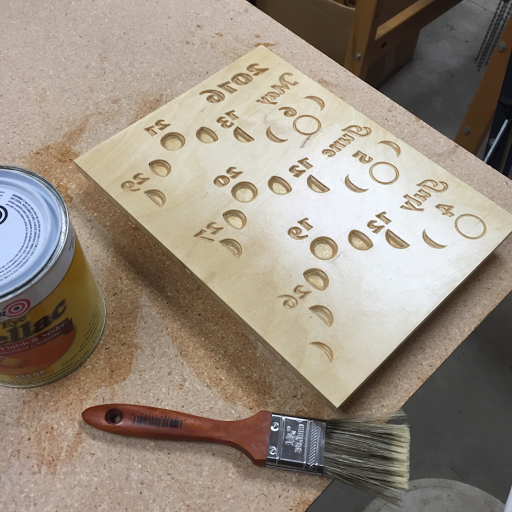 Before I can print, though, it needs one more coat of shellac to protect the newly carved wood from absorbing ink. If it gets in the crevices, I need to be able to wipe it out. Once that was dry, I was able to ink up and pull a proof. Here’s the final analysis: the plate was not flat and level enough. Text is a great choice to disclose every tiny imperfection. Notice how “May” looks bold while “July” looks semibold? Look at the counter in the 6 of “July 26” and then “May 6”. The top of the plate was slightly taller, like 1/100th of an inch, making the carver cut a little deeper there. Since I’m using a V shaped bit, deeper means wider, which means bolder type. I don’t know why the plate is deeper at the top. Maybe there were shellac drops on the back of the plate. Maybe the wood is warped. Maybe it warped when I shellacked it. Maybe I sanded it unevenly. Maybe the bed of the carver is mounted very slightly off level. I’ve got three more days to explore each of these, and maybe more, so that I can bring a perfect plate to Eugene next weekend. “Art Under Pressure” indeed!